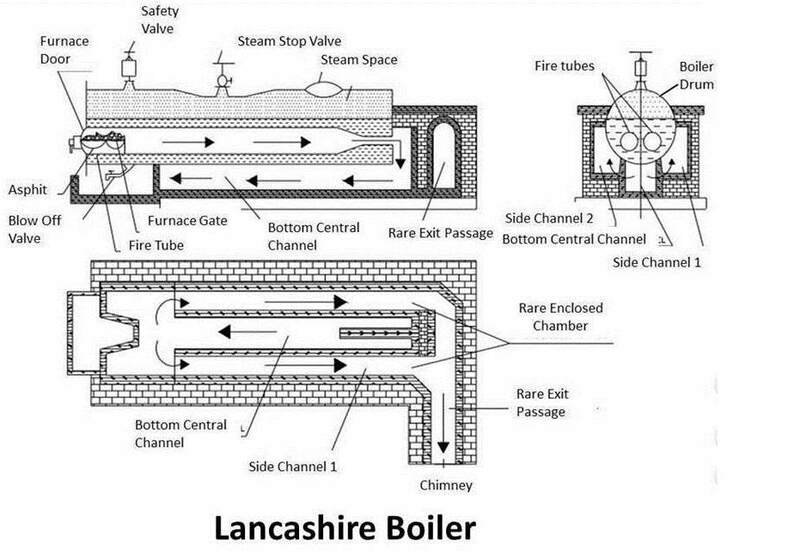 Today we will learn about Lancashire boiler. This is the most common boiler is the Sugarnand Cotton industries. 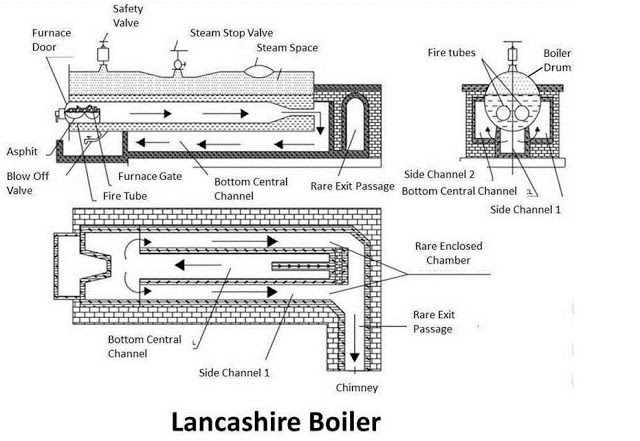 Lancashire is a horizontal, stationary fire tube boiler. This boiler is invented by Sir William Fairbairn in the year 1844.The flue gases flows through the fire tube, situated inside the boiler shell, so it is a fire tube boiler. This boiler generatenlow pressure steam. It a internally fired boiler because the furnace is placed inside the boiler. This boiler works on the basic principle of heat ex-changer. It is basically a shell and tube type heat ex-changer in which the flue gases flow through the tubes and the water flows through shell. The heat is transfer from flue gases to the water through convection. It is a natural circulation boiler which uses natural current to flow the water inside the boiler. As we discussed, this boiler is similar a shell and tube type heat ex-changer. It consist a large drum of diameter up to 4-6 meter and length up to 9-10 meter. This drum consist two fire tube of diameter up to 40% of the diameter of shell. The water drum is placed over the bricks works. Three spaces create between the drum and the bricks, one is at bottom and two are in sides as shown in figure. Flue gases passes through the fire tubes and side and bottom space. The water level inside the drum is always above the side channels of flue gases, so more heat transfer to the water. The drum is half filled with water and the upper half space for steam. The Furnace is located at one end of the fire tubes inside the boiler. The low brick is situated at the grates (space where fuel burns) which does not allow to un-burned fuel and ash to flow in fire tubes. The boiler also consist other necessary mountings and accessories like economizer, super heater, safety valve, pressure gauge, water gauge, etc. to perform better. Note : For better understanding right click on image & open it in new tab. The Lancashire boiler is a shell and tube type heat ex-changer. The fuel is burn at the grate. The water is pumped into the shell through the economizer which increases the temperature of water. Now the shell is half filled with water. The fire tube is fully immersed into the water. The fuel is charged at the grate which produces flue gases. These flue gases first passes through the fire tube from one end to another. This fire tubes transfer 80-90% of total heat to the water. The backward flue gases passes from the bottom passage where it transfer 8-10% heat to water.The remaining flue gases passes from the side passage where it transfer 6-8% of heat to water. The brick is the lower conductor of heat, so work as heat insulator. The steam produces in drum shell it taken out from the upper side where it flows through super heater if required. So the steam produce is taken by out for process work. For better understanding of working of Lancashire boiler, watch the video. 1. This boiler is easy to clean and inspect. 2. It is more reliable and can generate large amount of steam. 3. It required less maintenance. 5. It can easily operate. 6. It can easily meet with load requirement. 7. Lancashire boiler has high thermal efficiency about 80-90%. 1. This boiler required more floor space. 2. This boiler has leakage problem. 3. It requires more time to generate steam. 4. 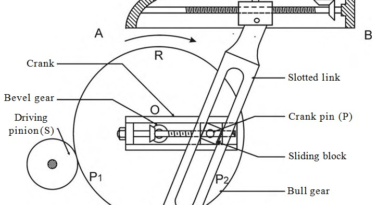 It cannot generate high pressure steam if required. 5. Grates are situated at the inlet of fire tube, which has small diameter. So the grate area is limited in this boiler. Today we have discussed about Lancashire boiler. If you have any query regarding this boiler, ask by commenting below. If you like this article, don’t forget to share it on social networks. Subscribe our website for more informative articles. Thanks for reading it. What’s the efficiency of it without economiser? ?